For more information about this event, please contact Esencia Flamenca at info@esenciaflamencahk.com. Adrian Santana, The First prize winner of the 58th Internatinal Festival of Cante De Las Minas De La Union, will be back to Hong Kong to perform "Convivencia" with Mariko Drayton (dancer) and live music of Jesus Corbacho (singer) and Yerai Cortes (guitarist). 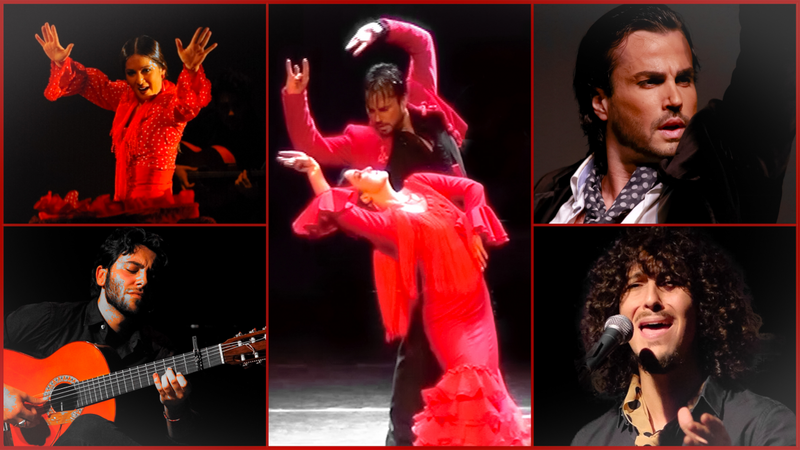 In the intimate setting, you will feel the breathe, the air, the passion of flamenco right here in Hong Kong. Cannot be missed!! Adrian Santana, the First prize winner of International Festival of Cante de Las Minas de la Union, was born in Malaga and comes from a family of artists. His uncle Pepito Vargas, a well-known flamenco dancer, taught him all his knowledge about the art of flamenco. He continued to study at Conservatorio Profesional de Danza de Málaga. At the age of seventeen, he joined the cast of choreographer Carmen Mota where he worked as a soloist for five years. He then worked for Jose Porcel’s flamenco company in London, the company of Camborio and Lucia del Real at the Rome Opera “La Traviata”, the production of Paco Mora in the Bienal de Flamenco de Malaga, the company of Aida Gomez, the show “Flamenco Hoy” by Carlos Saura sharing the stage with artists like Concha Jareno, Pastora Galvan and Rocio Molina. He also has worked at Flamenco Festival USA, “Dressed to Dance” presented the Guggenheim Museum in New York led by Margaret Jova and choreographed by Carlos Chamorro sharing the stage with artists like María Pagés, Manuel Linan and Rocío Molina among others. In 2010 he received 2nd Prize at XIX Certamen de Coreografía de Danza Española y Flamenco de Madrid with his piece “Siempre me pasa lo mismo", subsequently presented in the Sala Pradillo in Madrid to great acclaim. He has participated as a part of the best dance companies highlighting Aída Gómez, Carlos Saura, Manuel Liñán/Daniel Doña, Margaret Jova productions, Carlos Chamorro and Rocío Molina, sharing the stage with artists such as María Pagés, Lola Greco, Javier Latorre, Belén Maya, Pastora Galván, Nani Paños, Concha Jareño and Rafael Estévez on stages and festivals such as Festival de Jerez, Seville Biennial and the Acropolis in Greece, Flamenco Festival London/New York, among many others. He has been directed by prestigious artists such as Antonio Canales and master Granero in different productions and is been well known in the tablaos Villa Rosa, Las Carboneras, Casa Patas, El Corral de la Moreria and El Arenal. He has been performing in “NOMADA” by Cia. Manuel Liñan. He was invited and performed with City Chamber Orchestra of Hong Kong in 2013 and 2014. He also presented his own production “SIMBIOSIS” at Los Veranos del Corral at Corral del Carbon in Granada in August 2014 and Biennal de Flamenco Malaga in May 2015. He was invited as a residence teacher at University of New Mexico for a month and performed “ SIMBIOSIS” at 30th anniversary Festival de flamenco in Albuquerque, one of the biggest flamenco festival in the world, in 2017 as one of the leading artists. He also collaborated with Esencia Flamenca HK to present his show “La Partida” in Hong Kong and Japan in 2016 and in SuZhou 2018 and "El Encuentro" in Hong Kong in 2017, "Convivencia" in Fukuoka and Tokyo Japan in 2017. In addition to his experience as a dancer, he teaches courses in different cities and conservatories in Spain and also around the world such as Taiwan, Japan, Hong Kong, Singapore, USA, Israel. Although Mariko is originally from Tokyo, Japan, she started to study flamenco in 1994 in Boston, US with Omayra Amaya, and her first exposure to real flamenco life was her role as house manager for Omayra’s show, which lasted 8 months. That gave her the opportunity to meet a host of artists from Spain. From that point Mariko was captivated by the magical art of flamenco. She moved back to Tokyo in 1999. She continued to study flamenco with Antonio Alonso, a former principal dancer at Ballet Nacional de España. Mariko performed many shows as a member of the Antonio Alonso Dance Company in Japan. These included productions of Carmen, together with the Japan Philharmonic Orchestra at Suntory Hall in Tokyo, with the New Japan Philharmonic Orchestra at Opera City in Tokyo (which was broadcast on Japanese television), and with the Okayama Philharmonic Orchestra in Okayama. In 2010, she moved to Hong Kong and kept studying and performing with Clara Ramona in Hong Kong. She found Esencia Flamenca in 2015 with Chloe Cheung and keep studying, teaching, organizing events with great artists such as Adrian Santana, Guadalupe Torres, Concha Jareño, Pedro Cordoba, Manuel Liñan, Javier Latorre, Alfonso Losa, Miguel Angel Espino and more in Hong Kong, Japan and Spain. Born in Huelva, Jesus Corbacho's passion for flamenco started at a very early age. When he was only two and a half years old he was singing his first fandangos with a perfect tone. Since then he has not stopped getting awards, like the First Prize of the National Fandangos Contest “Paco Toronjo” Alosno, Saeta Young Award in Jerez de la Frontera (Cadiz), Special Award for the Best Malagueña in the Great Singing Competition “Singing Tower” of Alhaurin de la Torre and finalist at the awards Camaron, Manolo Caracol, Cayetano Muriel, Pepe Marchena and Niña de los Peines in the XVIII National Flamenco Art Contest of Cordoba. He has participated in global and important events, such as The Flamenco Year of Cordoba, Cante Flamenco Festival of Albaizín, the 1st Flamenco Biennial of Netherlands and the 46th International Festival of Cante de las Minas de La Union, Bienal de Flamenco de Malaga, Festival de Jerez, Flamenco Festival de Albuqurque. He also has done tours in Spain, Austria, Italy, Mexico, Sweden, Portugal, Norway, Taiwan, Bulgaria, Denmark, France, Belgium, Netherlands, Greece, Canada, USA, Japan among others. In addition, he is obtaining a great success with his first CD called "Debajo del Romero" and the attractive videoclip "Lo que yo quiero es estar contigo". He is also recognized as a great teacher at workshops. Born on May 24, 1995, Yerai Cortés from Alicante, his passion for flamenco comes from his family. Currently he is based in Madrid, where he began his career working at some of the best flamenco venues in the city, like Las Carboneras, Villa Rosa, Casa Patas and Corral de la Moreria amongst others. Despite his young age, he has already been able to work at the Teatro de Bellas Artes de Madrid, el Teatro Coliseum de Barcelona and the Lope de Vega in Seville amongst others and many major flamenco festivals such as Flamenco Festival de Jerez, Flamenco Festival de Albuqurque, Flamenco Madrid, etc. He had the honor of accompanying artists like La Negra, La Tana, Olga Pericet, Richard Bona, Marco Flores, Alfonso Losa, Manuel Liñan, Las Hermanas Bautista, Chucito Valdés and Javier Colina, Guadalupe Torres, Vannesa Coloma, Adrian Santana, amongst others. Recently he has been playing for Farruquito. And he has been traveling with those artists all over the world. In addition, he is a composer and singer for Juan Debel and Yerai Cortes’s project as well as with Ismael de la Rosa "El Bola". He also performed with Esencia Flamenca HK to present Adrian Santana’s show “La Partida” in Hong Kong and Japan in 2016 and in SuZhou 2018 as well as "El Encuentro" in Hong Kong 2017, "Convivencia" in Fukuoka and Tokyo 2017.